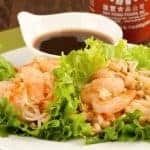 The filling for these little dumplings is simple to prepare, and because you are starting out with cooked shrimp, they cook up pretty quickly. The assembly process can be a bit of a challenge if, like me, you are not adept at pleating the wonton wrappers around the filling, but don’t let that discourage you from making them. 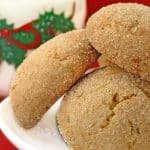 The filling for these little dumplings is simple to make, delicately flavored with ginger and garlic. 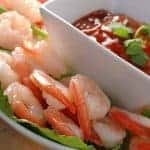 Place the shrimp in the bowl of a food processor, and pulse until finely chopped. In a small bowl, combine the green onions, garlic, ginger, soy sauce, vinegar, chili sauce, sesame oil and cornstarch. Add this mixture to the shrimp and pulse again until well blended and fairly smooth. Refrigerate until you are ready to make dumplings. To assemble the dumplings, place about two teaspoons of filling in the center of a won ton wrapper. Wet the edges of the wrapper with a water moistened finger, and fold the sides upward, pleating the wrapper as you go around, leaving the top center open. 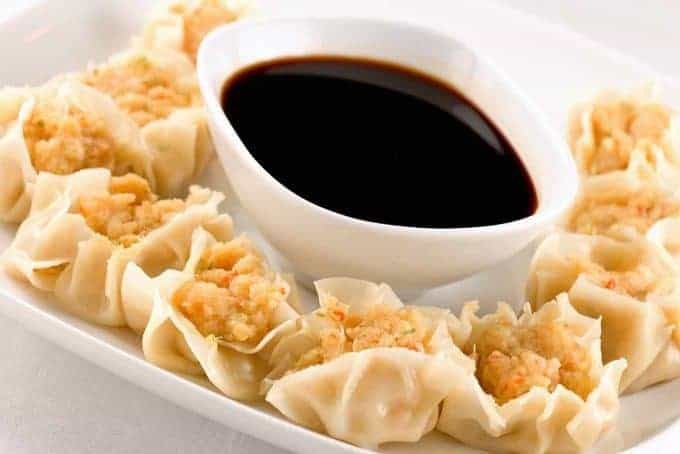 Place each assembled dumpling on a large platter and cover lightly with plastic wrap to keep moist as you continue to work. Prepare the dipping sauce by combining the sweet Thai chili sauce, soy sauce and rice vinegar in a small bowl. Pour into a serving dish and set aside until ready to serve. To steam the dumplings, place a steamer rack in a large pot with about 1/2 inch of water in the bottom. Line the rack with lettuce leaves, or brush with sesame oil, then bring water to a boil. Arrange the dumplings on the rack in a single layer, but not touching. You will probably have to work in batches. Cover and steam for 8 minutes. 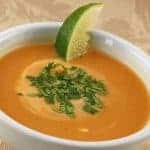 Serve hot with dipping sauce. Once assembled, the dumplings can be frozen in a single layer, tightly wrapped for up to 2 weeks. Thaw in the refrigerator prior to steaming.